I was installing yet another iTunes update, and was sufficiently bored/brain dead to actually read the License agreement. I took a screen shot. You’re not going to believe this. Read it yourself next time you install. As far as I can gather, iTunes can’t be used in conjunction with the production, development or design of Nuclear or Chemical weapons. I guess you have to use Windows Media Player when you’re building WMD’s. I wonder if NORAD or the Pentagon know they can’t use iTunes in thier cafeteria jukebox. Perhaps that was the real reason we were in Iraq. It wasn’t the threat of them building nuclear weapons. It was that they were using iTunes at the time! Damn them. Is there nothing they hold sacred? And who the hell is on a ‘Denied Persons Entity List’? And why would I send them software? I’m going to start reading these more closely. 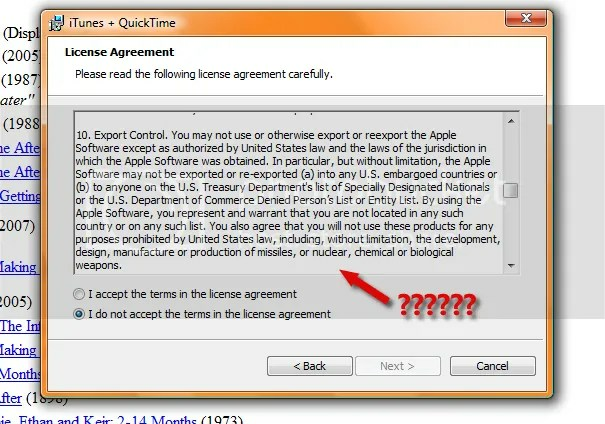 No, I do not ‘accept the terms of the license agreement’!